Currently I’m bracing myself for the start of the school summer holidays, and our annual fortnight away. We always go on self-catering holidays, to help keep the costs in check. Aside from stuffing the boot with swimming costumes, sun cream and sandals, I also pack a box of provisions. If you really want to cut your shopping bill while away, it pays to take some storecupboard essentials from home. I try to do a meal plan based on quick and easy family favourites before we leave. Then I can identify the crucial ingredients where I only need a teaspoon here, or a couple of ounces there. I’m not suggesting surviving on a suitcase of Pot Noodles. It’s more that food bills soon rocket if you have to buy a whole jar, bag or packet, when you only need a single tablespoon of chill powder, a teaspoon of cinnamon or just one stock cube. Also, much as it might be fun to visit local markets or delis, I’d rather spend less time slogging around a big supermarket with a couple of bored children. So I book an online supermarket delivery for the night we arrive, for fresh food, and bring some long-lasting ingredients with us. Then we only have to do top up shops here and there. I bunged this list into mysupermarket.co.uk, and had a look at Morrisons as a reasonably low cost supermarket. Even sticking to own brands and offers, it still came to more than £60, without the gin. Ouch. I’d rather take the stuff from home, and have more to spend on the holiday. Any suggestions for other food it pays to pack when you go on holiday? I’d love to hear. Not exactly a food suggestin, but we've learnt always to take a knife sharpener with us. Makes cooking so much easier if you can sharpen the normally blunt knives! Plus it means we leave the place better than we found it usually. 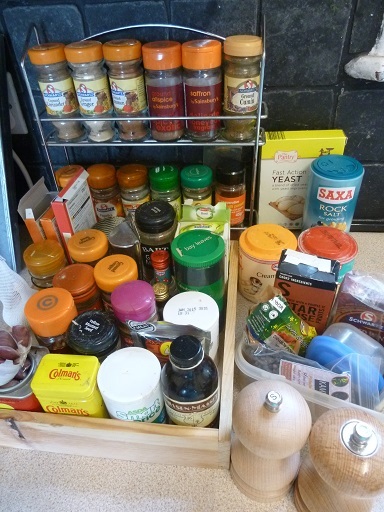 Quite agree that it makes sense to take store cupboard things we'll only use a little of. Other than that, we make an effort to support the local shops as much as we can, so we're not another drain on the local economy. Hope you have a lovely time, wherever it is you're going. And that the sun shines for you! I agree with you that it is always cheaper to take stuff with you. I make a meal plan. I always take ready prepared meals which I have made and frozen, like our chicken pie mix (chicken, mushrooms and onions in a creamy home made sauce) spag bol and a can of kidney beans to change it into a chilli if we feel like it, kale and chickpea curry, Slimming World chicken tikka masala. (delish), fresh salmon. Then I might make up some zippy bags with a recipe I fancy and in the bag put all the ingredients for that recipe. i.e. garlic, ginger, herbs or spices in a little container already weighed or measured out etc. You don't have to take the whole bottle of stuff with you if you measure it out first. Then, depending on what we have been doing that day, we can either come back and get the meal out of the freezer or cook from scratch. I make three loaves of bread and cut them in half and freeze, so you don't waste any bread, you just take half out of the freezer that morning. It has worked for us for the last 20 years. I also make a very large couscous and add loads of fruit and veg to it, it keeps in the fridge for several days and we can take it in small boxes for our lunch, when we go out for the day. We always take two china mugs, a knife sharpener, sharp knives, measuring spoons, potato peeler, a frying pan, my favourite wooden spoons for cooking, ACV, Olive oil (buy a small bottle and refill from the large bottle),mayo and tom sauces, stock cubes, garlic, salt, pepper, coffee, tea bags, milk, (we don't use sugar) cereal, eggs, bacon, sausages, baked beans, and wine. I have a wipe clean list which I work through so we don't forget anything. (a little OCD I must admit)! But don't forget to check there is a freezer, because we got caught out earlier this year when the cottage stated it had a freezer, only to arrive and find it was the freezer BOX in the top of the fridge. And we struggled to get all our food into it!! Oops sorry I rambled on a a bit. Thanks for the great tips Catherine! I am in awe of the prepared meals and zippy bags of measured ingredients, as I always have the best of intentions but never quite get that far. Agree about the importance of taking some decent kitchen equipment too, like a properly sharp knife and potato peeler. Some self-catering cottages only contain the bare minimum of equipment, and having familiar tools that actually work makes cooking so much easier.